With a mission to mobilize new energy to restore political balance, Bold Nebraska creates advocacy campaigns on important issues affecting people living in this great state, from the eastern cities to the western Sandhills. As the lead designer for their brand, the work created has included a large variety of print and digital projects. 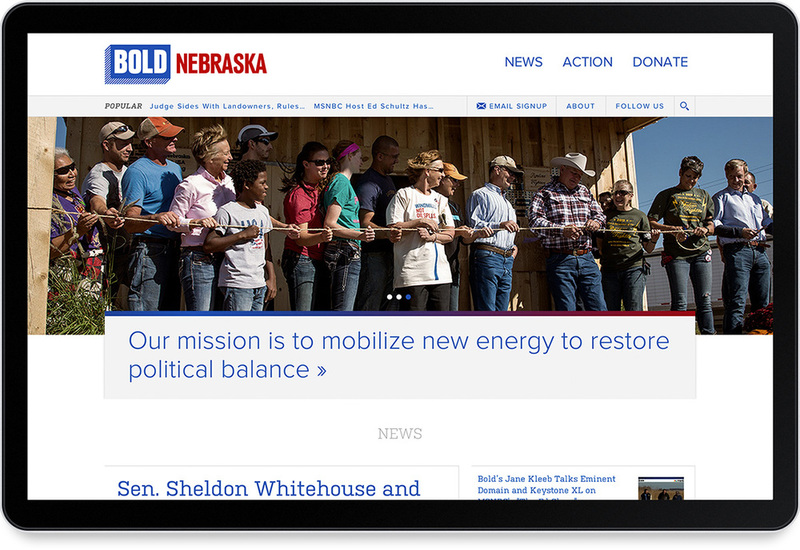 Most recently, we’ve launched the new BoldNebraska.org to proudly put their ideas out there on a modern, responsive site. The first iteration of the brand was first created in 2010 to be a political news site and action hub for the progressives, independents, moderates and populists. Over the last four years, it’s safe to say Bold Nebraska has certainly moved the needle, going back to the roots of Nebraska politics. The issues they have taken on include the TransCanada Pipeline, government accountability, voting rights, health care reform, local food and Nebraska energy. We don’t want the status quo. We want all of our voices represented in Congress, in state elected officials and in our local politics. We want a Bold Nebraska.